Oct. 6 Update: The Northeast Regional Climate Center reports that an additional record was set on Sept. 30 at Elkins WV: 1.86" (old record 1.03" in 1976). In addition to the records set earlier in North Carolina, the torrential rainfall from a weather system fed in part by the moisture from the remnants of Tropical Storm Nicole smashed rainfall records yesterday and today from the Mid Atlantic area through the Northeast. In the Washington DC region, records were set at all 3 major reporting locations. At Washington National, the 4.66" exceeded by nearly 2" the old record for the date of 2.76" set in 1924. This was also the third highest September daily amount for the 140 years of records, behind 4.76" on the 16th in 1976 and 5.16" on the 2nd in 1922. Washington DC records began in 1871. At Washington Dulles, the 4.74" destroyed by a factor of 5 the old record for Sept. 30 of 0.86" set in 1976. It was also the third highest amount for any day in September, exceeded only by 5.11" on the 6th in 2008 and 5.52" on the 14th in 1966. This means that 2 out of the 3 highest daily totals for September at Dulles have now been set in the last 3 years. Records began at Dulles in 1963. At Baltimore-Washington International, the 6.02" was almost four times the previous Baltimore record of 1.60" in 1920. It was the highest amount for any day in September since records began in 1870. The old record was 5.97" on the 24th in 1912. It was also the second highest rainfall for any day in any month at Baltimore, behind the 7.62" on Aug. 23, 1933. 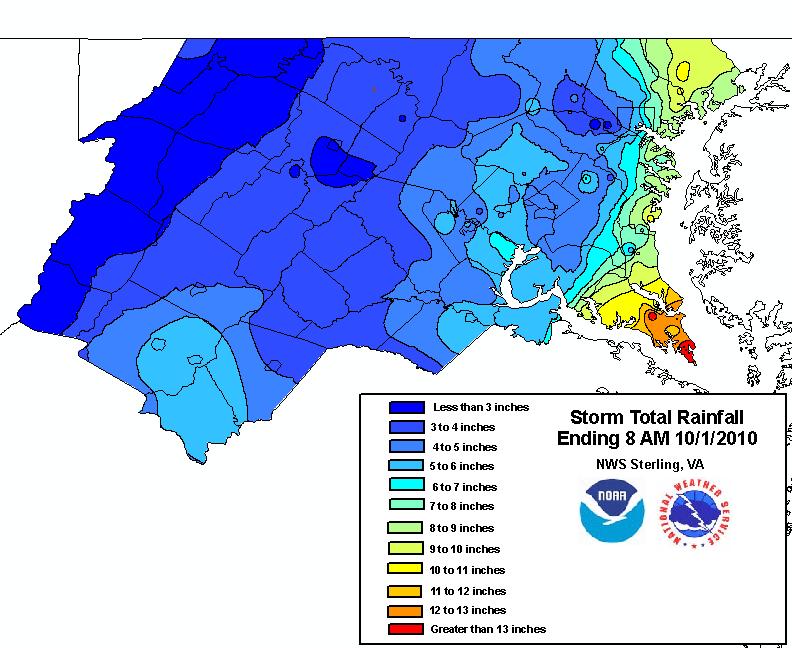 Rainfall amounts were even higher along the western shore of the Chesapeake Bay, ranging up to 13" in southern St. Mary's County MD. The Norfolk rainfall was the second highest for any day in September, behind only the 8.93" on the 1st in 2006. Seven of the 30 daily records for September at Norfolk have now been set in the last 9 years. 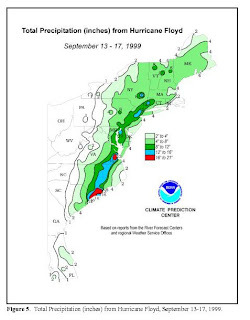 Norfolk precipitation records began in 1871. The Binghamton amount was a new all-time daily record, beating the old record of 4.05" on June 27, 2006. The old September daily record was 3.50" on the 27th in 1985. The top two all-time daily precipitation amounts at Binghamton have now occurred in the last 5 years. Binghamton records began in 1951. The Albany total was the second highest for any day in October, slightly under the 3.09" on the 9th in 1903. Albany records began in 1874. Reports of fire dept. rescues in New Bern, NC. 32 streets reported flooded in the town of Ahoskie, NC. Route 5 is now closed in Great Mills, MD. Numerous intersections remain closed in Fairfax County, VA. Numerous Baltimore Co. closures due to flood including Route 40 in Catonsville Hts. More rain approaching. Over 5" of rain triggered small-stream flood causing Millersville Univ. to close for the day. Downed trees also. Widespread street flooding, with roads closed reported in Tremont, PA. Already a top 10 wettest day on record in Allentown, PA (4.33"). NWS has adjusted downward the flood crest forecast for the Schuylkill @ Philadelphia to 14'. Would be highest since Floyd '99. No travel advised due to numerous flooded roads in Cortland County, NY. Reports of evacuations in McGraw. Flood becoming serious in central NY. Many roads covered by 6-12 inches of water in Rome, NY. 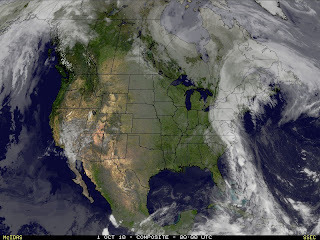 Image (click to enlarge): U.S. composite satellite image at 8 pm EDT, September 30, 2010 shows moisture streaming northward from the tropics over the Mid Atlantic coast and into the Northeast, from SSEC/University of Wisconsin. 9 PM Update: The rain finally ended at Wilmington a little before 7 pm. The 6-hour total precipitation ending at 8 pm was 1.27". 6 PM Update: Wilmington has received 0.14" more in the last hour as the rainfall has diminished to moderate. Elizabeth City's total so far today of 4.09" is still short of the record 4.52" for the date. The 2.53" at Richmond VA is below the record of 2.85". Today's 5.62" at Norfolk VA through 5 pm is a new record for the date. It's the third highest daily record for all of September. An additional 0.19" has fallen in the last hour. 5 PM Update: The 0.42" in the latest hour brings the 3-hour total to 1.11". As of 4 pm, today's total was 1.74" and September to date was 22.17". Added Hurricane Floyd precipitation map (click to enlarge) from Climate Prediction Center/NOAA and links to Floyd reports. 4 PM Update: Heavy rain continues, 0.39" more in the last hour. 3 PM Update: An additional 0.30" has fallen in the last hour with visibility reduced to 1.5 miles in continuing heavy rain. 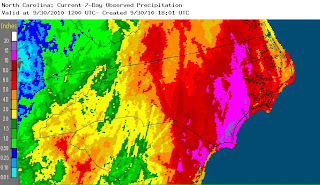 Excessive rainfall in the Cape Fear region of North Carolina from a tropical conveyor belt including the remnants of Tropical Storm Nicole has broken the total rainfall record from Hurricane Floyd in 1999. The Floyd rainfall has been described by the National Weather Service as a once-in-500-year event. The NWS reported this morning that the 19.66" at Wilmington in the 3 days ending yesterday is the highest 3-day total precipitation in records that began in 1871. The 10.33" on Monday is also the second highest all-time single day amount following Floyd's 13.38" on Sept. 15, 1999. The September total so far of 20.84" through this morning is the second highest for the month behind 1999. Heavy rain is continuing at Wilmington, and an additional 0.45" has fallen in the 6 hours ending at 2 pm EDT. 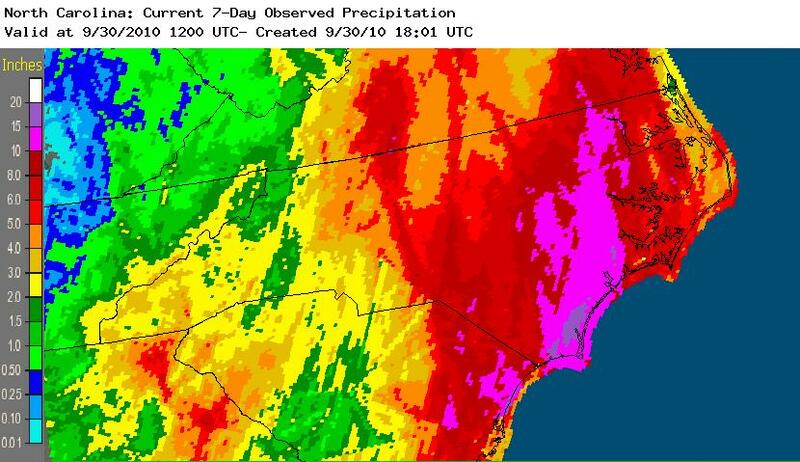 The map to the right (click to enlarge) from NWS shows North Carolina 7-day total precipitation ending at 8 am EDT this morning. The purple area extending from eastern South Carolina northward through the southeastern coast of North Carolina and to the Virginia border represents 10-15" of precipitation, with a smaller area near the coast of 15-20". As of 9 am PDT this morning, the sensor was up and running again. The current temperature is still hot, but only 92°. ASTERISKS BROKE OR TIED ALL-TIME RECORDS. 6 PM (PDT) Update: Caution: Although the National Weather Service is continuing to report the all-time record high temperature for Los Angeles, the reports for the last 5 hours since the record high have been missing, which could indicate the possibility of sensor failure. Final record reports are subject to quality control review before they are certified. OF 110 DEGREES SET ON SEPTEMBER 26TH 1963. AT 1130 AM PDT. THAT TIED THE DAILY RECORD WHICH WAS SET IN 1963. BROKE THE DAILY RECORD OF 104 DEGREES SET IN 1963. OF 99 DEGREES SET IN 1963. TODAY. THAT BROKE THE DAILY RECORD OF 99 DEGREES SET IN 1970. BROKE THE DAILY RECORD OF 99 DEGREES SET IN 1917. THE HIGH TEMPERATURE AT PASO ROBLES AIRPORT TODAY WAS 108 DEGREES. THAT BROKE THE DAILY RECORD OF 105 DEGREES SET IN 1963. THE HIGH TEMPERATURE AT LANCASTER AIRPORT TODAY WAS 103 DEGREES. THAT TIED THE DAILY RECORD WHICH WAS SET IN 2003. TIED THE DAILY RECORD WHICH WAS SET IN 2003. A RECORD HIGH TEMPERATURE OF 94 DEGREES WAS SET AT RENO TAHOE AIRPORT NV TODAY. THIS BREAKS THE OLD RECORD OF 93 SET IN 2009. REACHED 113 DEGREES AT 1215 PM PDT THIS AFTERNOON. ALSO BREAKS THE RECORD FOR THE DAY OF 106 SET IN 1963. At 1 pm PDT, the temperature at downtown Los Angeles was 112°, but the reports for the subsequent 2 hours were missing. As shown on the map, the heat has extended well offshore, with the station at Avalon on Santa Catalina Island reporting 103° at 1 pm PDT.